“Coachella has become so big, even two back-to-back weekends aren’t enough to satiate eager music fans. 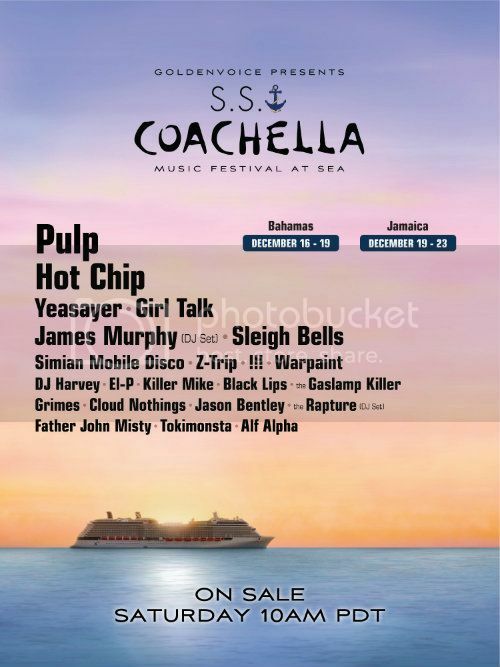 The fest’s promoter Goldenvoice has announced that it will launch S.S. Coachella, two separate sailings with the same lineup. Pulp will headline the two inaugral voyages: Fort Lauderdale to the Bahamas from December 16-19, and Fort Lauderdale to Jamaica from December 19-23. The best part of a Coachella cruise? No never-ending traffic to get to the venue each day. Find out more details and check out the full lineup below. Both cruises will take place on cruise ship Celebrity Silhouette, which offers 12 dining venues, 9 bars, multiple live music settings, a spa and an impressive pool deck. NEWS: DJ 2Hot now EXCLUSIVELY with Direct Music Service!